With its massive Y-Beam legs, the Gaston Shuffleboard by Plank & Hide gives a definite nod to its centuries old origins. The Gaston would be right at home in a medieval public house; imagine the impact it could have on the décor in your game room. This show-stopper is constructed of solid Aspen and is finished in a deep coffee. The Gaston features a one piece butcher block playing field, finished with a thick quarter inch polymer that will last for decades. This provides for a smooth surface on which your professional grade pucks can glide. It's equipped with heavy duty climatic adjusters to allow you to have a level table even if your floor is not. 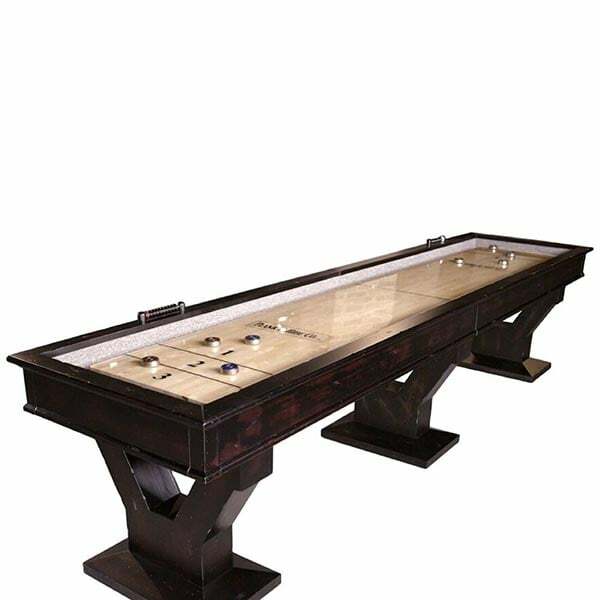 The extraordinary shuffleboard table cabinet can be broken down into two pieces for ease of transport and installation. Available in both 12’ and 14’ versions.